The fights resonate still: The Fight of the Century, Down Goes Frazier!, The Rumble in the Jungle, The Thrilla in Manila. And the fighters, too—MUHAMMAD ALI, JOE FRAZIER, GEORGE FOREMAN—three complicated and competitive men who happened to be vying for sport’s biggest prize when boxing was still a national reassurance and its champion a cultural resource. They fought five times for that title, from 1971 to 1975, ranging across the globe, and their struggles, triumphs, and defeats echo through the years as well. Buy at Amazon. 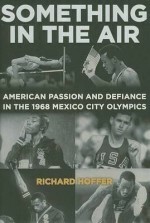 Something in the Air is Richard Hoffer’s gripping sports narrative that tells the individual stories of the athletes who gathered in Mexico City in 1968, a year of dramatic upheaval around the world. Racial tensions were high on the U.S. Olympic team, where inflamed black athletes had to choose between demands for justice, on the one hand, and loyalty to country, on the other. Buy at Amazon. 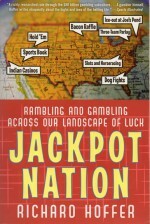 In Jackpot Nation, Richard Hoffer takes us on a headlong tour, alternately horrifying and hilarious, across our landscape of luck. Whether he’s trying to win a side of bacon in a Minnesota bar, hustling a paper sack filled with $100,000 in cash across Las Vegas parking lots, poring over expansion plans with a tribal chief in California, or visiting the New York prison cell of a retired bus salesman with a poor understanding of three-game parlays, Hoffer explores with wit and heart our national inclination—a cultural predisposition, even—to take a chance. Buy at Amazon. 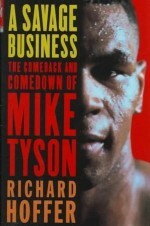 The strange saga of Mike Tyson is placed in stark relief by seasoned Sports Illustrated writer Richard Hoffer. Since his release from prison, Tyson has been at the center of a bizarre struggle to reclaim the heavyweight title without a noteworthy sporting moment–except for the infamous ear-biting episode. 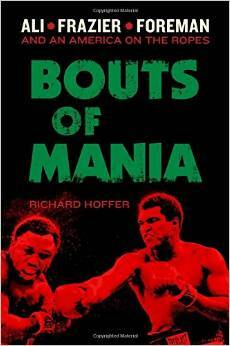 With wit and insight, Hoffer delineates the self-serving antics of the many handlers glomming on to the fighter, the insidious machinations of promoter Don King, and the confused behavior of Tyson himself. Buy at Amazon. Beloved, respected, and admired for his work on and off the basketball court, coach John Wooden remains a source of fascination and inspiration even after his passing in 2010 at age 99. 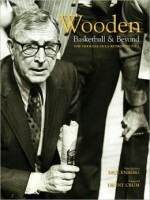 Wooden led the UCLA Bruins to 10 NCAA championships in 12 years—a record that will likely never be equaled—but his teachings and his impact reached far beyond basketball. Buy at Amazon.